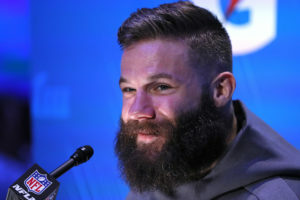 Edelman, one of only a few Jewish players in the league, is certainly the most successful, through his role as star quarterback Tom Brady’s favorite target. The Brady-to-Edelman connection has been a major part of the Patriots’ dominance in recent years, and after this season’s Super Bowl LIII victory against the L.A. Rams on Feb. 3, the pair has won three Super Bowls together. 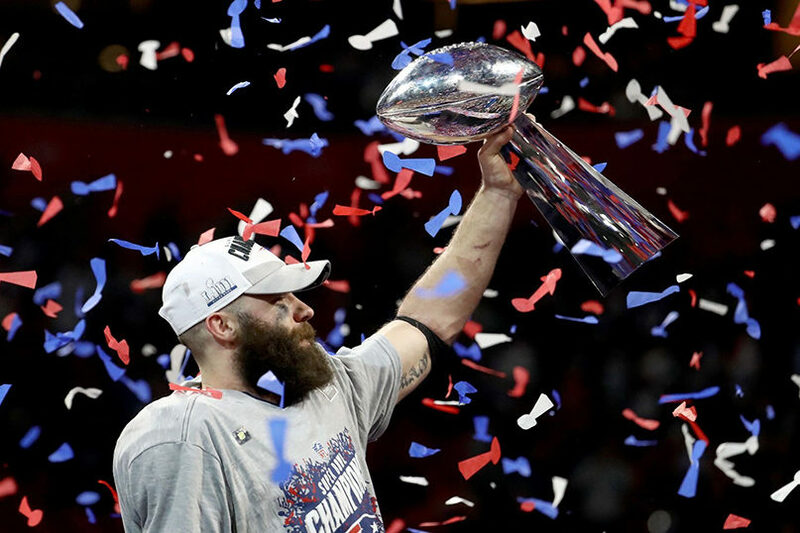 Edelman was named Most Valuable Player of this Super Bowl in Atlanta. He provided some of the rare offensive highlights in a torpid defensive game with a game-high 10 catches for 141 yards. Eight of those receptions led to first downs, keeping the ball out of the hands of the Rams’ potent young quarterback, Jared Goff. Edelman, 32, also is the most outwardly Jewish NFL player, embracing that side of his identity over time. He has a Jewish father but was not raised in the religion, and in the past, through the Patriots front office, often would defer on questions about his religion. himself as a standout until the 2013 season. Coincidentally or not, it was during his breakout year that Edelman identified as Jewish in an interview with the NFL Network. 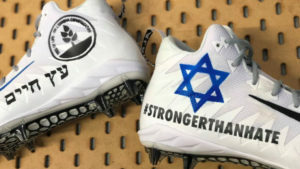 Patriots wide receiver Julian Edelman wore these cleats on Dec. 16, 2018 to remember the 11 Jewish victims of the Oct. 27 shooting at the Tree of Life*Or L’Simcha Synagogue in Pittsburgh. Credit: Julian Edelman/Twitter. (JNS) – Many Israelis came to work bleary-eyed on Monday morning, having stayed up all night watching the New England Patriots defeat the Los Angeles Rams in Super Bowl LIII. While the low-scoring affair certainly wasn’t the most exciting of championship games, that didn’t dampen the jubilation. New England Patriots owner Robert Kraft at the Kraft Family Sports Complex. Credit: American Football in Israel. Leibowitz says that the Patriots became Israel’s favorite NFL franchise thanks to the nearly two-decade old friendship between the AFI and Patriots owner Robert Kraft and his late wife, Myra. The Krafts have been the biggest supporters of football in Israel, assisting in the funding of the construction of a small Jerusalem football stadium in 2000, known as Kraft Family Stadium, near the Machane Yehuda outdoor market, and new Kraft Family Sports Campus on the outskirts of the city, which opened in 2017, boasting the country’s only full-sized regulation football field. The sports complex is a multimillion-dollar facility built in partnership between the Krafts, the city of Jerusalem and Israel’s lottery authority. It was inaugurated in the presence of the Kraft family, NFL commissioner Roger Goodell and 18 NFL Hall of Famers—some of the best to ever play the game—who were invited to Israel for a week of touring by the Kraft’s. Betzalel Friedman is the AFI’s director of tackle football and commissioner of the adult men’s Kraft Family Israel Football League (IFL). He tells JNS that currently more than 800 adults and high school players, who are in a separate league known as the Kraft Family Israel High School Football League (IHFL), currently play the traditional form of the sport with full pads and helmets. But for now, Leibowitz is savoring the Patriots’ victory over the Rams in their sixth Super Bowl win—and the fact the Most Valuable Player in the game was Julian Edelman, who identifies as being Jewish, and who several years ago made a special visit to Kraft Family Stadium to run drills with the younger players and give them some advice on football and life.